Why Business School and Why Now? In the spring of 2015, I went back and forth about a decision that would have a huge effect on my career and life. I was happy practicing neurology. I was active in my county, state, and national medical and neurologic societies. I felt that I had a sharp grasp of advocacy issues that were affecting not just neurology but all of medicine. Yet with all that said, I still felt that something was missing. Medicine was going through tremendous change, and at the root of this change was how health care would be managed in this country. There were new terms that I was unfamiliar with, such as physician burnout. Administrative burden and electronic health records (EHRs) became catchphrases known by all. I was doing well in my practice. We were growing and increasing service lines. I began to engage more actively with my hospital administration team about things that they wanted to accomplish (eg, increasing productivity and clinic access). Making the connection between what was needed from a business standpoint and a clinical standpoint became less clear. I realized then that I was doing well in the profession of medicine but didn’t know enough about the business of health care. In medical school and residency training, we received little training on how to manage a practice and the business aspects of providing health care to the patients we serve. As I think back to residency, we were never taught how to bill or what went into reimbursements for seeing patients. It was never emphasized that in an academic practice seeing 3 to 4 patients per half day is okay, but if you plan to go into private practice, you have to increase your efficiency and productivity to survive. It certainly was not emphasized how things like patient satisfaction scores would affect salary and reimbursement, and not enough attention was given to the increasing amount of data reporting that you would be responsible to complete. Health care was consuming more and more of the discussions we were having when we talked about medicine. I remember sitting as a delegate to the Texas Medical Association Annual Meeting when the presiding president of the organization, Tom Garcia, MD, delivered his address. He made a comment that “we are not ‘providers’ and our patients are not ‘consumers.’ We are doctors and we treat patients.” What resonated with me is that medicine should not be so transactional. It should not be treated as a mere service industry. It is more about relationships between a patient and his or her physician. The way that the business of health care was affecting the patient-physician relationship fascinated me and influenced me toward going to business school. To maximize my efforts as an advocate for patients, neurology, and medicine as a whole, I had to learn more about business. I truly felt that in order to thrive in this ever-changing health care landscape, a good grasp of business administration was necessary. I didn’t have years of owning my own practice as a teaching guide, so I decided to go back to school. I applied to the Executive Masters of Business Administration (MBA) program at the Jones School of Business at Rice University, known for its exceptional educational programs and ranked as one of the best business schools in the country. After talking to recent graduates and faculty, I really felt that this would be a great step toward accomplishing my goals. The networking opportunities were tremendous. The geographic location—in the medical center in Houston Texas, the second largest medical center in the nation—made it an ideal place to learn more about how business relates to health care. It was the right time for me to enroll. My practice was growing and evolving. I was taking on more and more leadership roles in my professional organizations. I worried that my lack of business experience would hurt my chances of getting into business school and, if accepted, succeeding in such a demanding program. Instead, the fact that I had been out of fellowship for about 6 years practicing medicine before going to business school was an advantage. Practicing medicine and participating in faculty leadership provided me with more business knowledge than I had anticipated. My involvement in organized medicine had already familiarized me with some of the most pressing issues that the house of medicine was facing. I knew that business school, in some way, would help me to put it all together and I was not disappointed. One of the biggest benefits of having an MBA and how it relates to medicine is my ability to better advocate for patients and physicians. 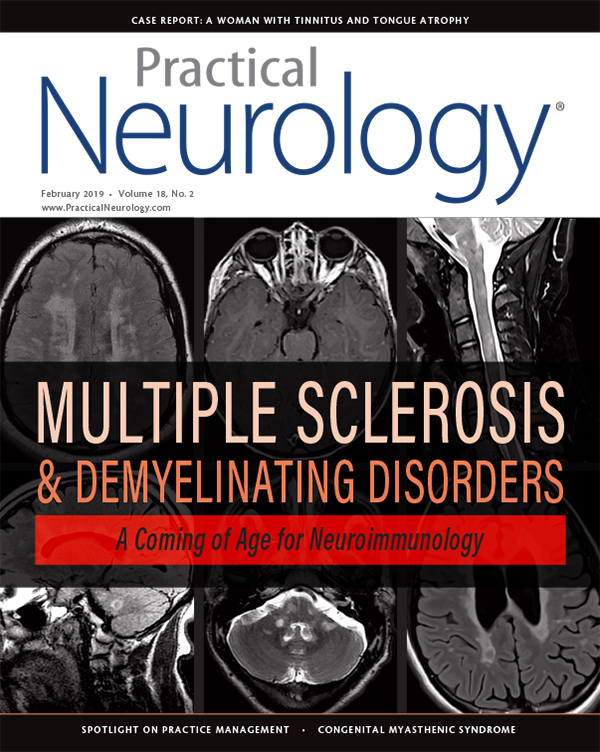 Neurologic drugs are among some of the most expensive drugs on the market with treatments for multiple sclerosis and dementia leading the way. But how are these prices established? How does drug pricing compare to product pricing in other industries? There is a lot that goes into product pricing. You have to thoroughly examine the landscape and competitive products. The cost of production and acquiring raw materials must be incorporated into the cost to consumers. Supply and demand curves tell you what the market will bear. Before going to business school, I thought the pharmaceutical industry seemed to diverge away from some of these basic principles of price determination. It seemed that they just plucked prices out of the air. But after examining cases such as the EpiPen, I learned that these executives were following some of the very same pricing principles used in other industries. The CEO of Mylan pharmaceutical company, which produced the EpiPen, made a business decision to increase revenue by increasing the price of a 2-vial box of the EpiPen from $100 to over $600 in 2016. As we move forward in this debate and figure out ways to reduce the cost of medications for patients, it’s important to understand the business model as to how these prices are established. There have been recent high-profile cases that highlight this point. The price hike trend is hurting our ability to provide price-conscientious care when pharmaceutical companies increase the price of an already lower-priced drug or entering the market with a high-priced pharmaceutical product. Understanding the science behind how pricing models work in other industries will allow us to better evaluate regulatory and policy efforts to curb prescription drug costs. Medicine has gone through a number of fundamental changes in recent years. Historically, physicians were entrepreneurs. They finished training, secured finances to open their practices, worked out the logistics of the clinic, hired someone to collect on what he or she was billing, and after paying the bills, received compensation for their hard work. With new regulatory rules in place, it has become much harder to run a private practice. The administrative burden has become overwhelming for the practicing physician. Coupling that with decreased reimbursements makes a dire situation even worse. I was at a recent presentation of the Harris County Medical Society when a graph was shown that illustrated that physician reimbursement has not kept pace with inflation. When adjusted for inflation, physicians are getting paid less than they were 20 years ago (Figure). But we are asked to do more and more. Keeping up with EHRs, reporting requirements for Medicare, improving patient satisfaction scores, and more is leading to frustration and burnout. For this reason, more physicians are seeking alternative practice models such as becoming an employed physician. Based on a recent survey, more than 50% of physicians are now employed physicians. There can be benefits to this. But with it comes a loss of autonomy and control of certain processes. What you give up in accepting the administrative help is the ability to make your own financial decisions without more extensive due process. Figure. 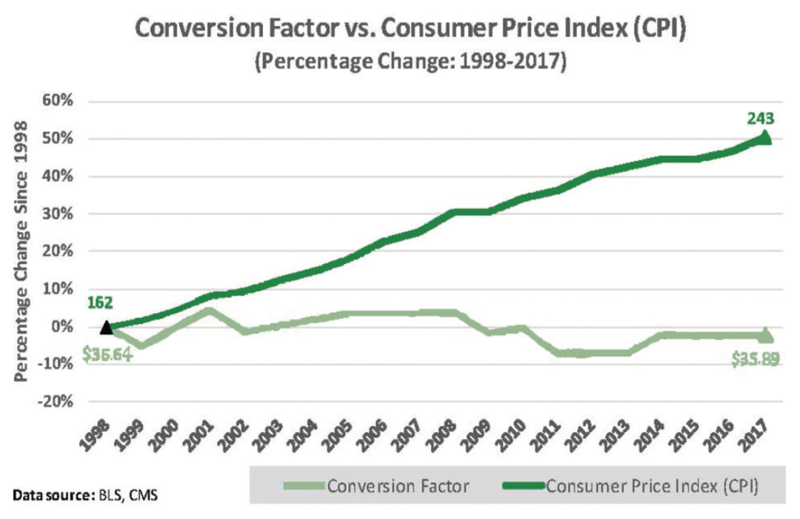 The consumer price index (CPI), a way to evaluate inflation, is graphed along with the medicare conversion factor (CF), which is a simplified measure of how much a physician will be reimbursed per relative value unit (RVU) billed. The CF has remained static as CPI has increased from 1998 to 2017. Data from Bureau of Labor and Statistics and Center for Medicare and Medicaid Services. Business school has equipped me with the skills to do capital budgeting more effectively. Private practitioners have been doing capital budgeting for years as a part of running their practice. If they want a piece of equipment, they look at the reimbursement for the test done with that equipment and figure out how long it will take to pay it off. This risk-to-benefit analysis is simple when there are only 1 or 2 practitioners involved. When you consider a larger system, with budgets and resources that have to be disbursed among a larger pool of people, justifying a request becomes more difficult, and business school has helped me learn to solve these more complex equations. One of the most surprising outcomes of my MBA is the vast and diverse network created by going through this program. Initially, I thought that being 1 of only 5 physicians in the class, with only 7 of us from the health care field out of 50 students, would be a disadvantage. The class was heavy in the oil and gas industry sector with many engineers. Other classmates worked in human resources and information technology or were entrepreneurs. This turned out to be an advantage and the diversity of our class was a hallmark of my experience. I had a different outlook and experience from students from other industries and also learned about health care by looking at other industries. For example, the 2 top industries in the world right now with “big data” are the oil and gas industry and health care. Both of these industries have done wonders in the past few years in innovating to collect increasing amounts of data. But both industries are also struggling with what to do with this data. How do we process the information and refine it in a way that it can be useful? This is just a single example of many pressing questions. Some of my classmates were Six Sigma Black Belts, giving them a vast knowledge about process improvement. When it comes to improving efficiency in a hospital or clinic, this knowledge is vital. By working with these individuals with years of experience and expertise, it helped me to develop and groom my own ideas about addressing clinic inefficiencies. The Rice Business alumni network has opened doors that I haven’t had the chance to explore yet, but being included in this group will help my career in the long run. Completing an MBA program has given me a deeper understanding of our health care system. I am excited about the potential opportunities that come with it. It was a large sacrifice and a steep learning curve for me in the beginning. The things that I have learned will undoubtedly help me in further developing my neurology practice. This degree will have a positive impact on my advocacy efforts as well. By understanding business and how it intertwines with health care, I feel more prepared to have a positive impact on neurology.